Russian President Vladimir Putin has ordered the start of the pullout of the Russian military from Syria starting Tuesday. 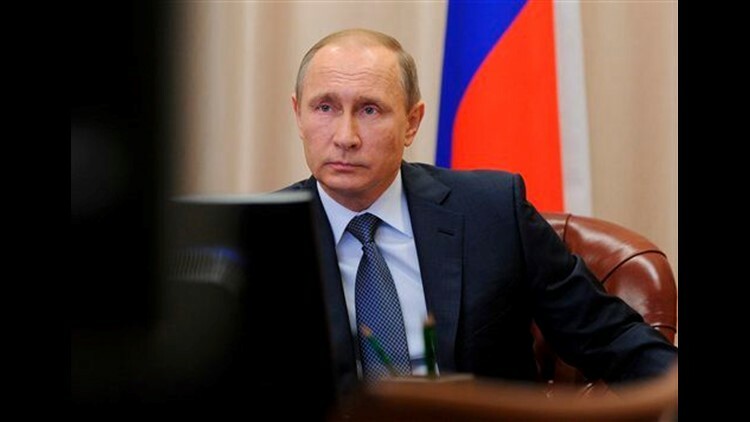 Putin said the move should help serve as a stimulus for Syria's political talks. The president said he coordinated the move with Syrian President Bashar Assad. Putin said that the Russian airbase in Hemeimeem in Syria's coastal province of Latakia and a naval facility in the Syrian port of Tartous will continue to operate. Russia says it has voiced concern about cease-fire violations by U.S.-backed rebels in Syria. The Defense Ministry said Monday that the Russian military coordination center in Syria had a conference call with its U.S. counterpart in Amman about violations of the Russian and U.S. brokered truce by opposition units near Kafr Nabudah in Hama province. It says militants in the area have been listed by the U.S. as abiding by the cease-fire. The cease-fire that began on Feb. 27 has largely held, but both Syrian President Bashar Assad's government and its foes have accused one another of violations. The Islamic State group and al-Qaida's branch in Syria, the Nusra Front, are excluded from the cease-fire, which is intended to bolster indirect Syrian peace talks that began Monday. Residents say protesters have set fire to the security compound of an al-Qaida-linked group in northern Syria a day after the extremists swept through the town detaining U.S.-backed rebels. An activist based in the northern town of Maaret al-Numan says the situation on Monday is "tense and boiling." He spoke on condition of anonymity for fear of being targeted by the extremist group. In recent days the al-Qaida-affiliated Nusra Front has raided the bases of the Free Syrian Army's Division 13 and stolen weapons and vehicles acquired with U.S. support. Division 13 enjoys widespread support in Maaret al-Numan. U.N. agencies and key partners say they are starting to get basic supplies to besieged areas in Syria but haven't reached about 20 percent of those in urgent need and are "extremely concerned" about some 500,000 people. They said in a joint statement Monday that since the beginning of the year the U.N. and its partners have reached over six million people with aid through regular deliveries and recent convoys to besieged towns. But U.N. humanitarian chief Stephen O'Brien and 10 other signatories said not enough aid is getting through and medical supplies and equipment are still being removed at checkpoints, which is "unacceptable." The head of the Syrian government delegation to the indirect peace talks in Geneva says his side's discussions with U.N. special envoy for Syria were "positive and constructive." Bashar Ja'afari told reporters after the meeting with Staffan de Mistura as the talks resumed on Monday in Switzerland that the government delegation "submitted ideas and views" for a political solution to the crisis. He says de Mistura will meet the representatives of the opposition on Tuesday and the government team again on Wednesday. Ja'afari says his team wants "to negotiate as Syrians under Syrian leadership without foreign intervention and without preconditions." He says any party that opposes this premise is "trying to sabotage this round." He was referring to the oppositions demands from the previous round that failed in early February, demands that had included an end to bombardment, release of detainees and the lifting of the siege by government troops on rebel-held areas across Syria. Russia's Foreign Minister says federalization is one possible option in Syria if it is the will of the Syrian people. Sergey Lavrov said Monday that Russia will support whatever solution the Syrian government and the opposition devise to end the country's war, including "any form (of government) whatever it may be called: federalization, decentralization, unitary state." Speaking after a joint briefing on Monday in Moscow with his Tunisian counterpart, Lavrov also said countries should not launch attacks against terrorists in Libya without first receiving permission from the U.N. Security Council. Lavrov said discussions about equipping Tunisian special forces in their fight against terrorism are ongoing. The U.N. special envoy for Syria says a resumption of peace talks between government envoys and representatives of the opposition is a "moment of truth" and insists the "only Plan B available is return to war." Staffan de Mistura spoke to reporters Monday moments before resuming "proximity talks" in Geneva, a month after suspending them in an upsurge in violence in Syria. The talks come as he said a "fragile" cease-fire has largely held since Feb. 27, and humanitarian aid deliveries have resumed in recent weeks. Many observers say the peace talks are the best chance in years to end a war moving into its sixth year, leaving at least 250,000 people dead and forcing at least 11 million people to leave their homes — many abroad.